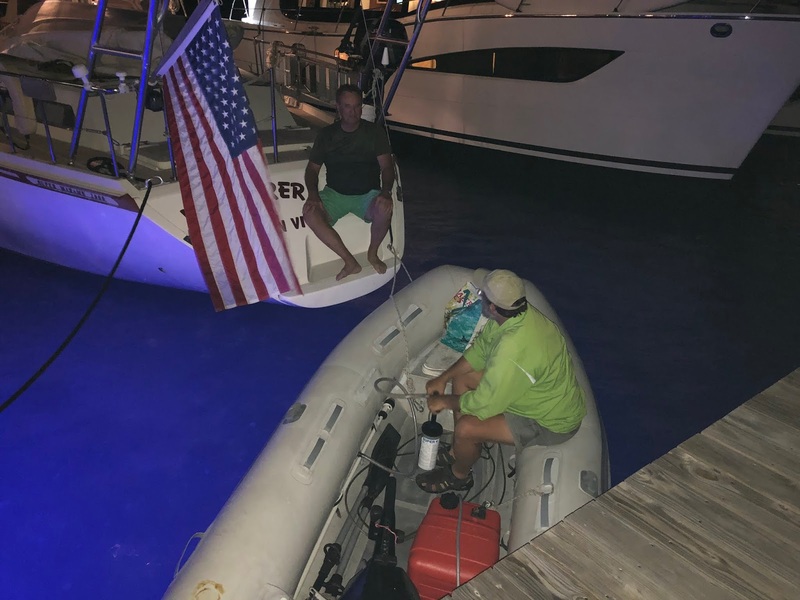 We checked with Robert at R&B Boatyard to find out when to bring in our boat. He told us to bring it in and tie up at his dock. After we were settled, Dave checked into how things would proceed. He found out that they actually won’t haul us out until tomorrow, but can dock for free tonight. Then we’ll be ready tomorrow morning at high tide. 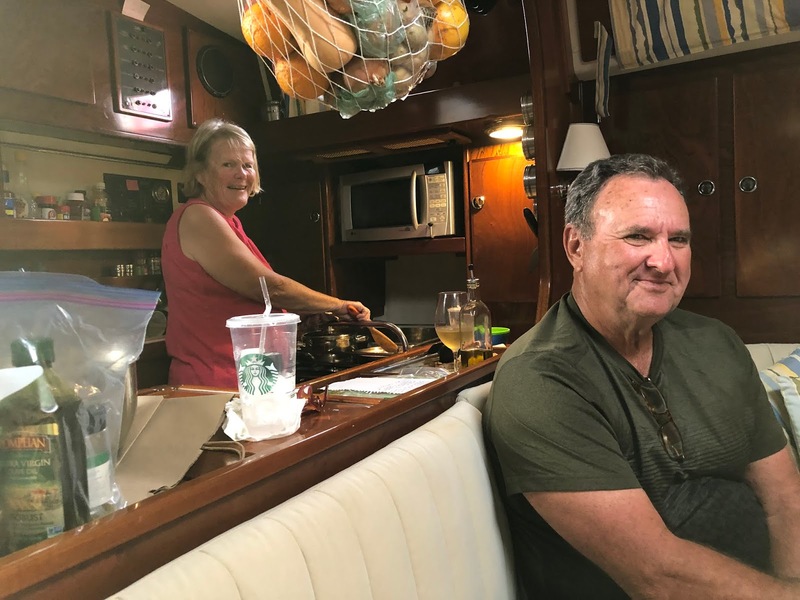 Dave also found out that they really don’t want us to live aboard the boat while it is in their boatyard. So I went to work to find us a place to stay until Tuesday. We have friends joining us on Sunday. And there is supposed to be bad weather on Tuesday. So I found us a cottage in Spanish Wells that was 4 bedroom, 2 bath, with a golf cart, kayaks and paddle board for $185/night. It was discounted for a last minute deal. Checking later, it looked like it was usually $205, which isn’t bad. Friends from the Georgia marina, Brunswick Landing Marina, were also in Spanish Wells. We met Duane and Peg Siegfried for lunch at the Shipyard Restaurant (where the prices reflect the atmosphere/view). We also met Priss and Beauth as we were leaving the restaurant. They had given Dave and Gene the fresh Mahi last week. It was great to meet them and thank them. Duane and Peg invited us to dinner on their boat that evening at Yacht Haven Marina a few blocks from us. They were just passing through the Bahamas on their way to the Caribbean. They stayed an extra day to visit with us. During the afternoon, I baked bread for our dinner. And I baked banana bread to “bride” the boatyard. Doesn’t hurt to “grease the wheels”. We also caught Priss and Beauth as they passed in their dingy and gave them some banana bread as a thank you for the Mahi. We made it the 10 blocks to Yacht Haven Marina in our dinghy. NOW the patches are working. BUT, it will only be a matter of time before the next leak shows up. And who knows where we’ll be. 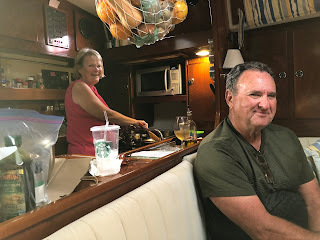 We had happy hour at Wreckers bar in the marina. 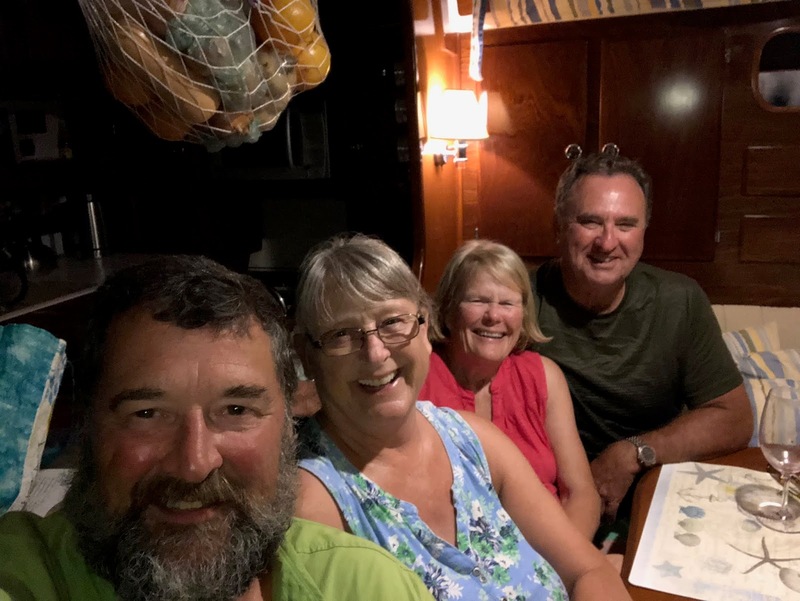 Then we had a lovely dinner on Duane and Peg’s 53 foot Amel. It’s amazing wha 10 more feet will give you on a boat. And we made it back to our boat without sinking in our dinghy. Fun to see BLM friends again.